This is a series of articles that tells the story of the 9 year history of the CB750, the bike that arguably had the greatest impact on motorcycling of any single model. This article, from a 1994 Cycle World issue, is a collection of quotes that date from the introduction of the CB750 in 1969. An article about the history and the historical significance of the CB750. Honda Motors published a series of articles on the development of the CB750 from its inception in 1967 until the first bikes rolled off the production line in 1969. This is an interesting series of articles with some great photos of the bikes and some early Japanese ad copy. The entire series on the history of Honda Motorcycles is worth reading. The CB750 Prototype Story is about a bike that was "discovered" in California with the claim that it was one of the original pre-production CB750's which Honda brought over to show to dealers prior to introducing the model into the US. The photos in this article come from a Japanese which ran a story about this particular bike. 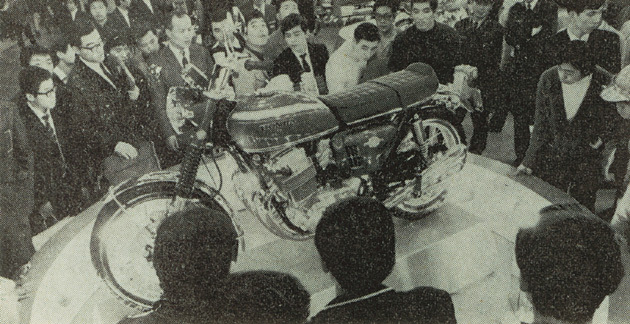 Unable to gauge demand for the new bike accurately, Honda limited its initial investment in the production dies for the CB750 by using a technique called permanent mold casting (often erroneously referred to as sandcasting) rather than diecasting for the engines. Once the demand for the bike became clear, Honda switched over to die casting using production dies for the engine cases. Due to their rarity, the sandcast bikes have been particularly desirable. A listing of all of the changes that the CB750 underwent from its inception in 1969 until the end of the era in 1978.